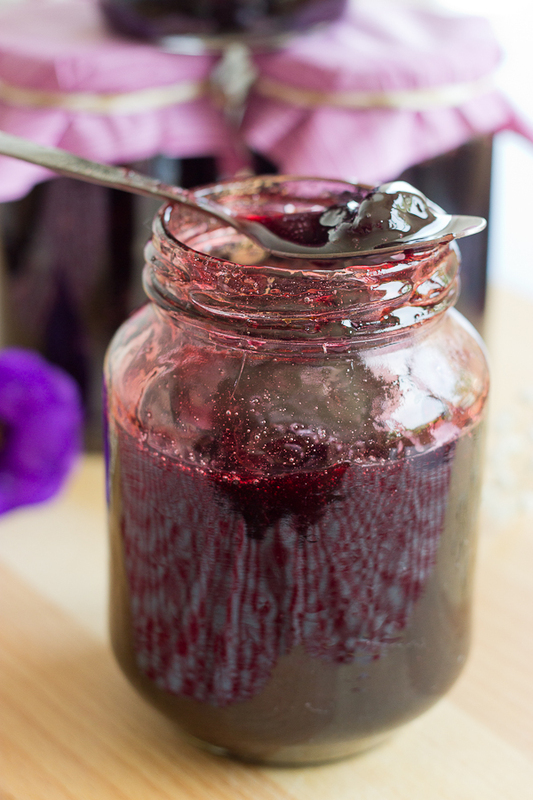 I think this jam comes as a natural ending to all the cherry recipes that have been happening around here. To be honest I was not planning on making cherry jam this year. Even though it doesn’t require any special abilities it definitely requires time. 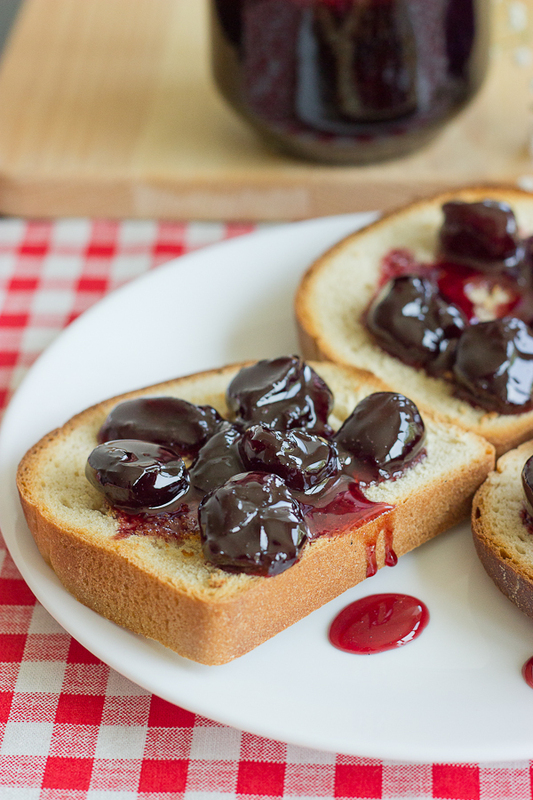 Seriously, easy cherry jam does not exist. 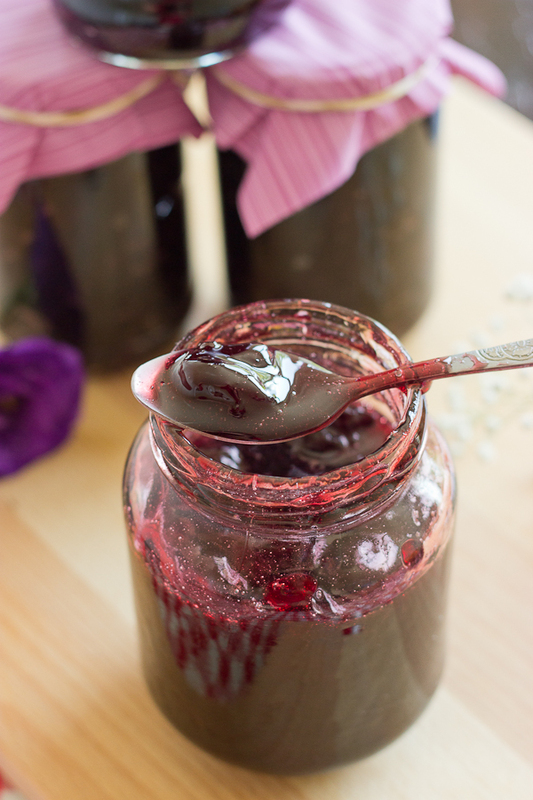 Unless you like whole cherries, pits included, in your jam, in which case you can totally make an easy cherry jam. Otherwise you will have to pit those cherries and it is not exactly a refreshing task, despite the cherry splashes all over your face. But… I love cherries and they are at their best only for a month each year. Which is extremely unfair, especially compared to the fact that onions and garlic are available year round. So when I friend gave me 10 kilograms of ripe fragrant black cherries straight out of his farm, I didn’t even blink for a moment. Because the frustration from pitting the cherries fades away fairly quickly, and at the end of the day I am always happy that I made the time to preserve a little piece of summer. And when in January you open the jar, while the snow is quietly laying up the streets, you will be glad to have a no fuss breakfast, packed with the taste of summer. 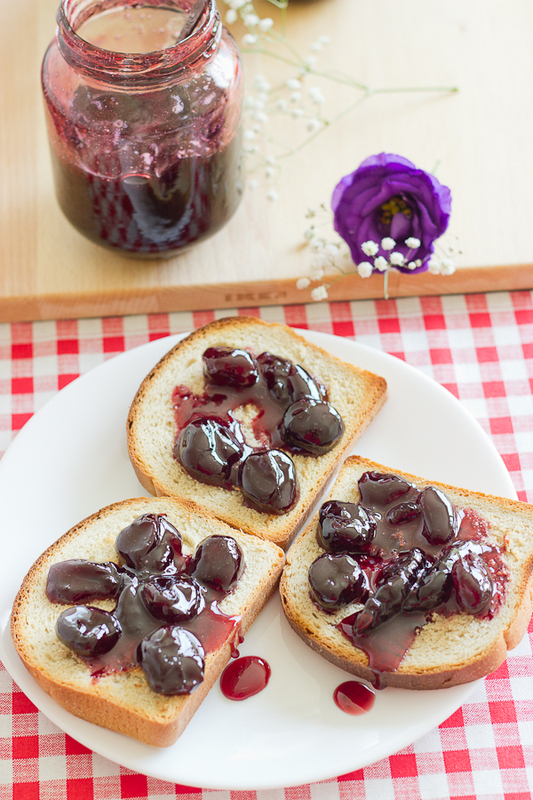 This is my grandmother’s recipe for cherry jam. It differs from most of the recipes I’ve seen, because the fruit to sugar ratio is 3:1, which is lower than the usual 2:1, or even 1:1. But the cherries are a very sweet fruit and they are just fine with less sugar. Besides this recipe has been tested hundreds of times and it never disappoints. Put aside the dreaded pitting, the process is fairly simple and straight forward – boil the fruit, fill the jars, stack for the winter. This really is my favorite jam, raspberries and strawberries are fine and I love them a lot, but this cherry jam, with the whole cherries in it, literally melts in your mouth. It is perfect with crepes, on a French toast, as a cheesecake topping and as an extra layer in cakes. 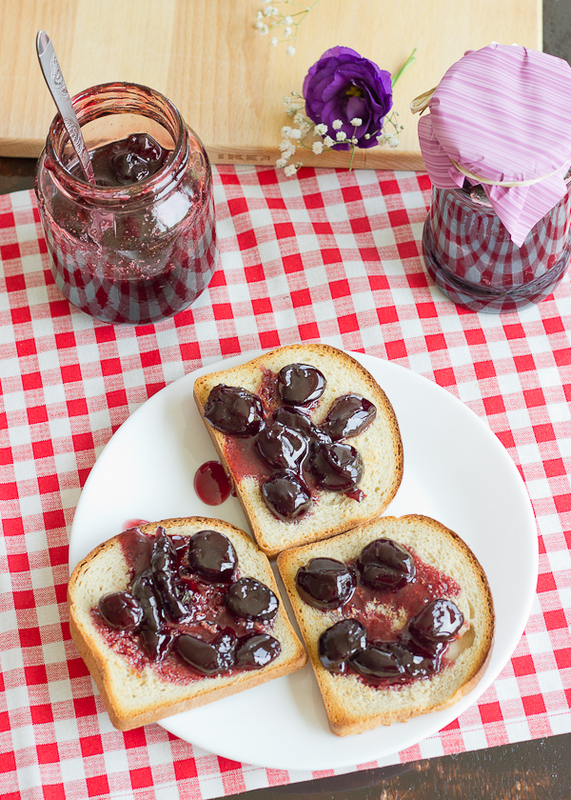 And a fool-proof breakfast is cherry jam on warm toast – only 3 minutes without any compromise with the taste and the quality, year-round. Believe me you will be glad you took the time to do it. 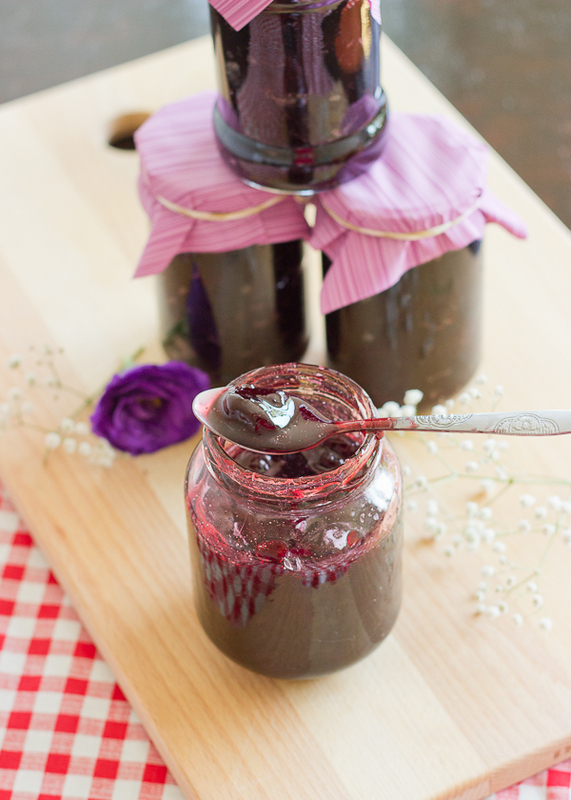 My Grandmother's recipe for Cherry Jam. It's the perfect filling or topping for everything, it melt's in your mouth and tastes like summer! Stem and pit the cherries. Divide them between two large bowls and add 500 gr. (1.1 pounds) of sugar to each bowl. Gently mix, using a wooden spoon, to distribute the sugar evenly and place in the refrigerator overnight. 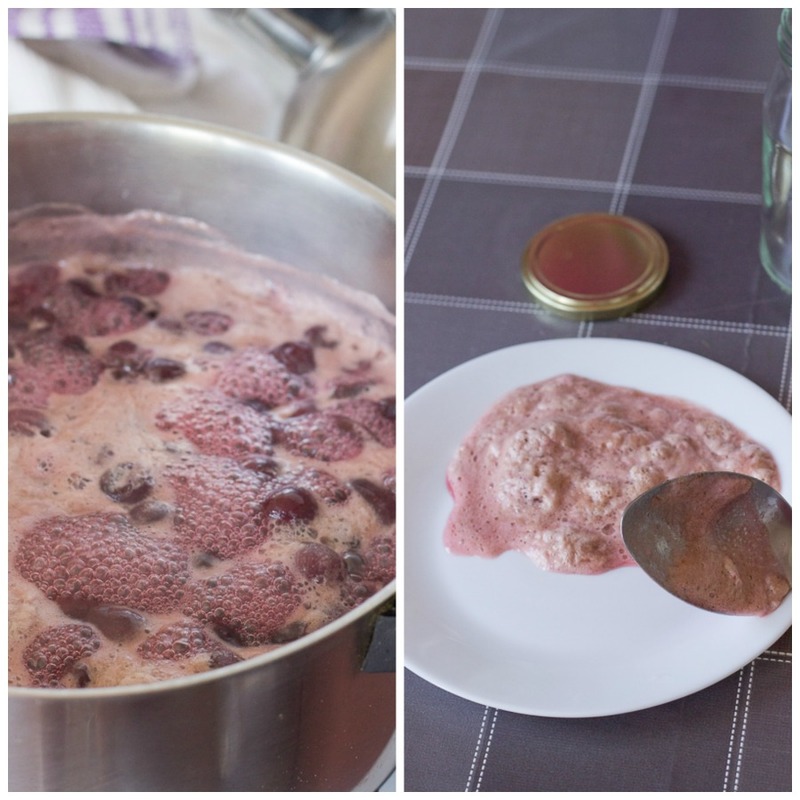 On the next day pour the cherries and the juice that has been extracted in a large pot. Place over medium heat stirring frequently. Thoroughly wash the jars you will use. I needed a total of 5 jars 400 gr. (1 oz.) each. 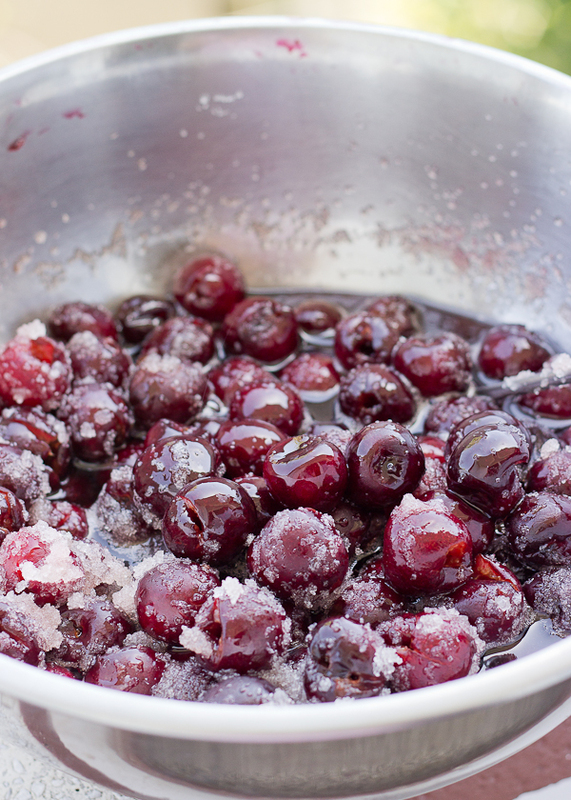 Cook the cherries for 1 hour and 20 minutes, stirring every so often. Spoon all the foam that forms on the surface. After 1 hour and 20 minute add the citric acid. The cherries should be cooked and the jam should be slightly thickened at this point. Remove from the heat and immediately pour into the prepared jars. Place the lids tightly and turn the jars up side down on a wooden board. Allow to cool completely and store in your pantry until needed. Note: I find that 1 and a half hour is the optimal time for this jam. The “plate in the freezer” test doesn’t work so good here, because the jam get too thick for my taste. Your jam is ready as long as when you place some on a cold plate, your finger leaves a distinct trace. i love cherry jam. this looks wonderful! Hi Yulia! Great recipe, cherries are good this year so I’m going to try it here in London. Here’s a tip for you: instead of skimming off the scum (and so throwing some jam away) leave it and when the jam is ready stir in a knob of unsalted butter. The scum disappears! Wow! Thank you so much,Rose! I will definitely try it next time! Btw I love London!